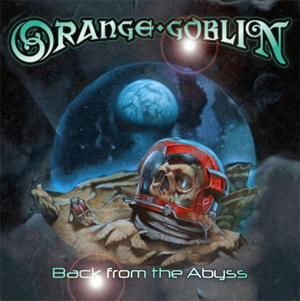 ORANGE GOBLIN will release their new abum, Back From The Abyss, on October 7th in North America via Candlelight Records. Recorded earlier this year in London, the album reunites the band with producer Jamie Dodd. It was mastered at Turan Audio in late July. Back From The Abyss will be available for pre-order via iTunes and Amazon beginning August 26th. Fans can now pre-order the CD via Candlelight's official webstore and Bandcamp page. Back From The Abyss follows the band's most successful release, 2012's A Eulogy For The Damned, and the recent reissue of their 2007 album Healing Through Fire. Featuring twelve new songs, it delivers the quartets now internationally respected heavy metal. Rocking hard as fans have come expect, Back From The Abyss shows not only the band's tried-and-true blues and doom but the high caliber of their musicianship. ORANGE GOBLIN will kick off the Autumn with a European tour alongside doom legends ST. VITUS. Set to begin in France on October 9th, the tour will work its way through thirteen countries before concluding in Germany on November 14th. On the tour's announcement Ward said, "We are extremely excited to be going on tour with our good friends and long-time heroes ST. VITUS. VITUS are one of the bands that inspired us to form ORANGE GOBLIN all those years ago and to be able to promote our new album and celebrate their thirty-fifth anniversary at the same time just blows my mind." "Into the Arms Of Morpheus"